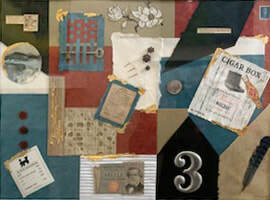 Collage, called the art genre for the 21st Century, has its roots in Art History. Artists, such as Picasso and Gris, have used paper, ink, paints, printed materials, and glue to express emotions and ideas. Students will learn about color, composition, the vast array of materials, and the methods to create a piece during the class. Mixed Media will be included. -Anything you want in your piece - if thick, mounting techniques will be described. Thin buttons, flat keys, stamps, foreign money, wallpaper, game cards, etc. -If you want a little glue to take home bring a well-washed shallow plastic container with a lid. -An old typewriter is available if you want to use a quote printed on brown paper or any kind of paper. ​This is fun! Don't feel overwhelmed or needing to be perfect right out of the gate. I have thrown out lots of efforts, even unframing pieces that I later felt didn't seem so luverly. I have been creating for decades and have taken many classes. Mary Moquin has been giving me a broader vision for my art for two years. I have moved from Folk Art and realism to abstraction in Acrylics, water color, and collage. I look forward to sharing my good and 'oops' moments in art.